Father L. M. Jego, a French priest and newly appointed pastor of The Church of St. John the Evangelist in Lambertville, began monthly trips to Flemington to celebrate Mass, usually at the homes of Flemington residents Miles Cunningham, Williams and Joseph Purcell, Nicholas Barry, or Daniel White. With just these families and a few hired girls, this small group comprised the bulk of his congregation here in Flemington and established the earliest roots of St. Magdalen de Pazzi Roman Catholic Church and its parish family. St. Magdalen’s spiritual roots run deep, growing from the seed of faith planted in Lambertville all the way back in 1843. Especially in its beautiful traditional architecture, St. John’s present church, dedicated in 1893, and still located on Bridge Street in downtown Lambertville, is a beacon of Catholic life past, present, and future. A new church, similar in appearance to the original, but more than twice its size, was built in 1879. The original St. Magdalen de Pazzi Roman Catholic Church, Flemington, built in 1858. At a meeting at the home of Miles Cunningham, the decision was made to purchase a lot from Sheriff Bonnell where a little wooden church, twenty-four by thirty-four feet, would be erected. At its completion, Bishop James Bayley, the first bishop of the Diocese of Newark, journeyed to Flemington to join Father Jego in dedicating the new house of God to St. Magdalen de Pazzi. On this occasion, the Sacrament of Confirmation was administered to six candidates, including a young man who would later be ordained a priest and become the Very Reverend Dean Mulligan. During the late 1800’s, the needs of a growing Catholic population, whose economy was boosted by new railroads expanding into the area, called for a larger church. 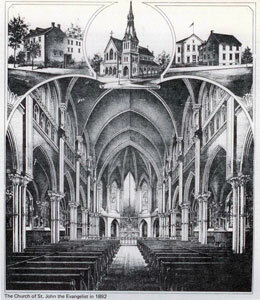 Reverend B. Henry Ter Woert, then pastor of St. John's following Father Jego’s return to France, directed that Flemington's Catholic Church would be replaced in 1879 by a gracious white frame building, thirty-seven by sixty-six feet, almost doubling the original structure's size. This stalwart little building served as our spiritual center until the 1940s. In 1892, John Foran came west from Port Chester, New York and purchased what was then the Johnson Foundry and later became the Foran Foundry & Manufacturing Company. Swelling the ranks of workers he brought along with him were a number of Catholics who made the trip to Flemington with the high hopes and enthusiasm characteristic of the more than three million immigrants who would reach America's shores before the decade was over. In the old country, religion was a way of life, accepted as part of the routine of daily living. In the new country, it became both a source of comfort and a major force in holding the family together. These people, so bereft of most of life's luxuries, needed and wanted the soothing ministrations of their church and the constant presence of a man of God in their midst, and to this end they devoted much of their energies. In 1902, the designation of “parish” brought to St. Magdalen’s the first full-time pastor to lead its growing flock of parishioners. Reverend Thomas Rudden, former curate at St. Bernard Church, Raritan was appointed by Bishop James A. McFaul, who also designated Clinton and Stockton as St. Magdalen's missions. Shortly after the new pastor’s arrival, the open-handed generosity of John Foran, who was noted for his gifts to the church, made it possible for Father Rudden to install electric lights and a new heating system. The pride of the parishioners must have been excusably great, for their church was one of the first buildings in this area to have electricity. 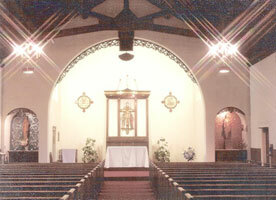 At the turn of the new century, the activity and interest of the parishioners in their church was reflected in the Altar and Rosary Society’s financing of the remodeling of the entrance to the church, and the generosity of Dr. and Mrs. Snowball funding the decorating of the interior sacred space. 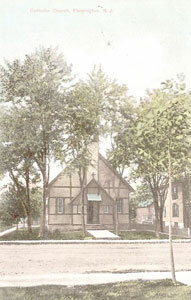 St. Magdalen’s second pastor, Reverend John E. Murray (later Right Reverend Monsignor), was able to purchase a house from Theodore Bellis for use as the rectory. Our historical parish minutes tell us that as the needs of the faithful continued to grow, a resolution was adopted which appropriated six hundred and fifty dollars to be used for the purchase and beautification of an additional tract of land at St. Mary Cemetery, located on Bonnell Street. Through the first World War and Great Depression, the number of St. Magdalen’s parishioners grew to include three and four generations following original settlers. These faithful families attended Mass and confession, had their children baptized, their weddings sanctified, and their dead laid to rest from this church. Now the growing need of a larger building in the not too distant future was apparent. By early 1941, a building fund drive was started with the hope of realizing sufficient funds for enlarging and improving the church. The response on the part of the parishioners was so gratifying that it was decided to raze the old church and build a new one. 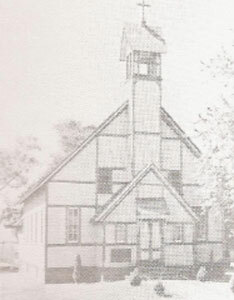 While construction was taking place, the old Flemington High School auditorium on Bonnell Street was used for Masses. 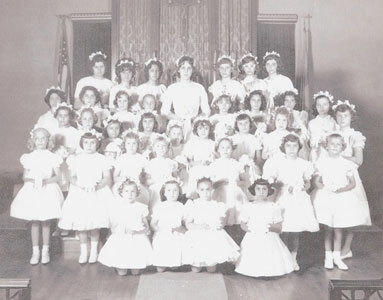 By Christmas of 1941, the congregation was able to hold its first Mass within the walls of the new church. As 1942 drew to a close, the laying of the cornerstone and dedication of the new Church of St. Magdalen de Pazzi, Flemington took place on Thanksgiving Day, November 26. Pius XII was the reigning Pope, the Most Reverend William Griffin was bishop, and Cornelius J. Kane was pastor. St. Magdalen de Pazzi Church, Park Avenue, Flemington. 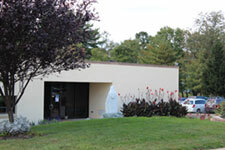 Today this building serves as one of the many Catholic Charities outreach facilities in the Diocese of Metuchen. The interior of the original Church; some of its sacred art can still be seen today in the sanctuary of our church on Mine Street. In 1945, four sisters, known as the “Loretto Nuns” arrived from the Institute of the Blessed Virgin Mary of Toronto, Ontario and were appointed as heads of the Religious Education department of St. Magdalen’s. In 1948, Reverend William A. Margerum was installed as St. Magdalen’s ninth and longest-tenured pastor to date, leading the parish for twenty years. By 1954, St. Magdalen’s continued to grow spiritually and in greater numbers, as the 50-acre Simon Farm (adjacent to the existing cemetery) was purchased, and the “Loretto Nuns” were replaced by the Missionary Sisters of Our Lady of Victory Noll, Huntington, Indiana. On May 9 of that year, a marble statue Shrine of Our Lady, constructed in a grotto by local contractor Roman Zyck, Jr., was dedicated. Each May, the Young Women’s Guild held “May Crowning” ceremonies of the Blessed Mother statue at the grotto, which became a well-attended annual event of the time. May Crowning of the Blessed Mother (1962) at the Old St. Magdalen’s Church, Park Avenue, Flemington. In September 1958, Monsignor Margerum purchased a beautiful white-pillared Georgian style home and several barns and outbuildings on a seven acre tract of land on Mine Street. 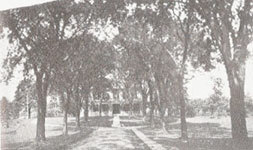 The sprawling property, purchased from Colonel Arthur F. Foran for fifty thousand dollars, would eventually become the bustling campus of present day St. Magdalen de Pazzi Roman Catholic Parish. The original Colonel Arthur F. Foran estate with its majestic, tree lined view from Mine Street. 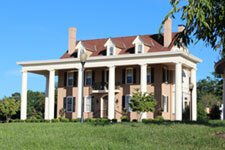 The well-preserved Foran home still stands today, serving as rectory for the priests of St. Magdalen de Pazzi. On St. Patrick’s Day in 1970, Bishop Ahr gave his approval for an expansion program for the Church’s Parish Center, the first new building to be erected on the Mine Street property. Led by St. Magdalen’s pastor, Reverend Edward J. O’Connell, the Parish Center would become the center of parish administrative offices and a generous gathering space. 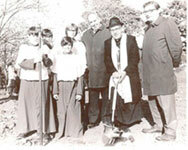 Altar servers accompany Father Edward J. O’Connell and Trustees Walter Foran (left) and John Krauss (right) at the ground breaking ceremony for the new Parish Center on November 11, 1973. George W. Ahr, Bishop of Trenton, blesses the new Parish Center on March 16, 1975. Following the completion of the centennial celebration of the Trenton Diocese, of which St. Magdalen’s was a part, the Diocese of Metuchen was created by Pope John Paul II on November 19, 1981. 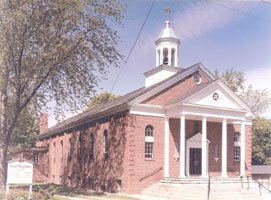 This new diocese was to include the counties of Middlesex, Somerset, Hunterdon and Warren. Theodore E. McCarrick was named the founding bishop of the new diocese and was installed at St. Francis of Assisi Cathedral, Metuchen on January 31, 1982. 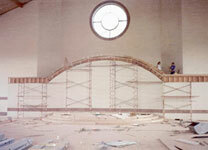 In 1989, the new and current St. Magdalen’s Church was built. On December 9, a dedication Mass was celebrated by Bishop Edward Hughes and St. Magdalen’s pastor, Reverend Henry L. Hemerling. 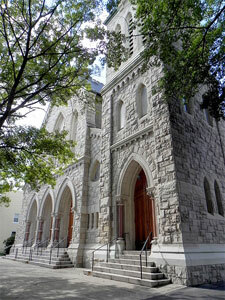 Construction of the new St. Magdalen’s Church on Mine Street began in 1989. Joined by the Knights of Columbus, Bishop Edward Hughes and Reverend John J. Barbella, pastor, dedicate a new statue of the Blessed Mother, on May 17, 1998. In September 2000, the Sisters of Jesus Our Hope came to St. Magdalen’s. By 2003, a new home on Bonnell Street was constructed for their use. The neighboring property was purchased and named Our Lady of Hope House for Social Ministries, the home for community outreach programs at St. Magdalen’s. That same year, Reverend Timothy A. Christy was installed by Bishop Paul G. Bootkoski as pastor of St. Magdalen’s. The Planting the Seeds Campaign was initiated to raise money for a new pipe organ and a Spiritual Formation Center to meet the needs of our growing religious education program. 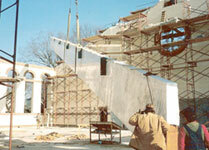 Construction began to transform the lower level of St. Magdalen’s Church into the new Spiritual Formation Center, which officially opened for the first day of CCD on September 30, 2004. 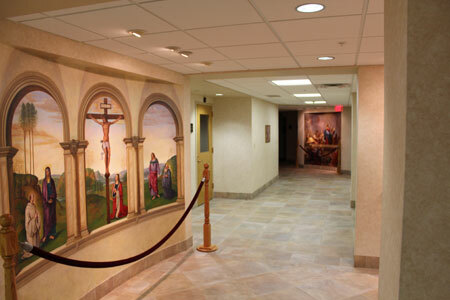 On November 20, 2004, Bishop Paul Bootkoski dedicated the new Spiritual Formation Center. 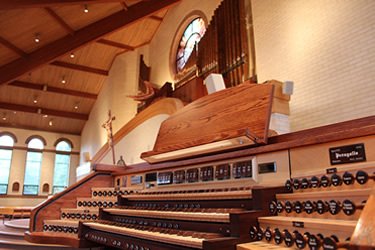 In the summer of 2006, the new pipe organ, custom built by the Peragallo Pipe Organ Company was installed and was played at its first wedding Mass on July 1. Between September 2000 and June of 2017 Sister Pat Vayda served as Director of Social Ministry supporting the Hope House and working with the Homebound ministry. Hope House is a social outreach ministry which distributes food, furniture, clothing, and other miscellaneous items to those in need. Sister Pat described Hope House in an article once as a ministry, which not only provides for the physical, but first and foremost the spiritual needs of souls. When someone in need reached out, Sister Pat met with the person, listened to their story, and sought to provide counsel. She oversaw a dedicated group of parishioners who help with the food pantry, staffed the office, and did whatever was needed to serve. She would often remind everyone that those who came through the door were Jesus in disguise. In June 2016 the Sisters of Jesus Our Hope left Saint Magdalen’s. Beginning in September of the same year the Sisters of Christian Charity begin their mission work. On May 3, 2016, Most Rev. James F. Checchio, J.C.D. was installed as the fifth Bishop of Metuchen. On September 23, 2017, Father Kenneth Brighenti was officially installed as the Pastor of Saint Magdalen’s.